"WhiteFeather, I love what you do with fur (and animals) in your art! ...I can't describe it but I get a feeling of a deep connection between human and animal and the natural world from your... art. And maybe a glimpse at how distorted our relationship to the natural world has become. I LOVE 'Homme Fatale', esp. the imagery of his wounds, to me symbolizes how wounded our relationship to the natural world is. He also reinforces to me how we (majority of the modern western world) have lost our sense of wonder and mythology and connection with our natural biological being." 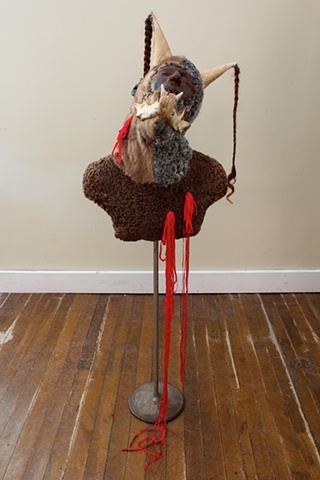 The wax cast face and ear used in this sculpture were created by artist Damien Worth (Prince Edward Island) and surrendered to me to work with as part of the Out of Purgatory exchange project between Eastern Edge Gallery (NFLD), Peake Street Studios (PEI) and Gallery Connexion (NB). Homme Fatale was featured on the cover of the exhibition catalogue, to accompany the exhibitions held concurrently at Confederation Centre Art Gallery (PEI), Gallery Connexion (NB) and Eastern Edge Gallery (NFLD). 52" x 18" x 13.5"